Today and tomorrow chances are you’ll bump into Wonder Woman or your friendly neighbourhood Spiderman in Dubai. Rest assured, the latest Avengers film is still weeks away and Halloween another six months — it’s just the Middle East Film and Comic Con (MEFCC) that’s back for its eighth run, which means the UAE’s geeks are out in full-force robed in their fantastical best cosplays. An anglicised portmanteau of ‘costume’ and ‘play’, cosplay is the Japanese pop culture phenomenon kosupure that sees fans of anime, manga, TV series and comic books dress up as the characters they revere. What started as a niche subculture hobby in Japan in the eighties, now has a full-blown annual championship where enthusiasts battle it out in elaborate high-grade costumes that’d put Hollywood and on-screen counterparts to shame, often spending hours, weeks, and sometimes months perfecting looks — cosplayers live by the tenet that mimicry is the highest form of flattery. 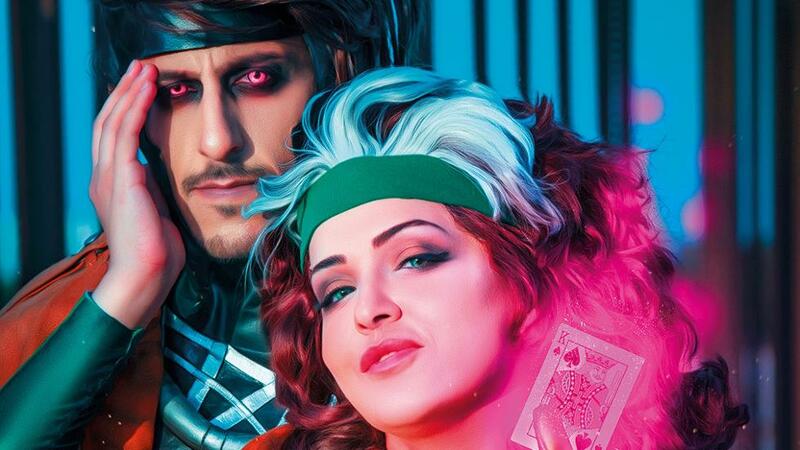 This year, the MEFCC is hosting the UAE preliminaries and the winning pair will represent the UAE at the World Cosplay Summit 2019 Championship Finals in Japan. Before you pigeonhole the hobby with adjectives like ludicrous, childish or an escapist fantasy of adults trapped in a Peter Pan complex, hear what passionate cosplayers have to say of the art form — for some, it’s evolved into a career, for others it’s an artistic release and for most it’s just wholesome, imaginative fun. The term Otaku is the Japanese variant of the English word geek used to describe diehard anime (Japanese animation) and manga (Japanese comics and graphic novels) fans. Like it’s English counterpart, the once disparaging term used to belittle fans, has now been reappropriated as a positive label — one that Sheikha wears as a badge of honour. While other kids would doodle stick figures in their textbooks, she would draw anime characters and would be late to classes because she was busy playing video games. Then when Sheikha discovered cosplaying at MEFCC 2014, she had stumbled into the perfect medium to pay tribute to the characters she loves. And so, she convinced her doubtful older sisters to rock up to the event the next year dressed as FBI agents accompanying her convict character. Her sisters were sold. But not everyone else is as supportive as her family and friends, with criticisms of her chosen hobby being too childish or ‘attention-seeking behaviour that create a bad image’ being flung at her — common brickbats female cosplayers endure — but Sheikha remains unflappable. The geeks (and Okatus) have truly inherited the earth. What Khalid started as an open Facebook group to share images of these outfits with friends in Libya soon saw people who consume all kinds of pop culture join, share their experiences, and the page snowballed into becoming the UAE Cosplayers Group — the largest online community of cosplayers in the GCC. Outside of social networks too cosplaying makes for a great icebreaker. His favourite characters to portray are sarcastic anime figures with a bit of swagger and wit. ‘Think Deadpool and Spiderman,’ he says. One Thursday night in 2012, commuters on the Dubai Metro were left startled — Wolverine had boarded the train at Union station, retractable claws out, blood splattered across his face and clothes and an uncharacteristic apologetic grin plastered. ‘That was the first year of MEFCC and my friends and I didn’t have a car, so we took the Metro. 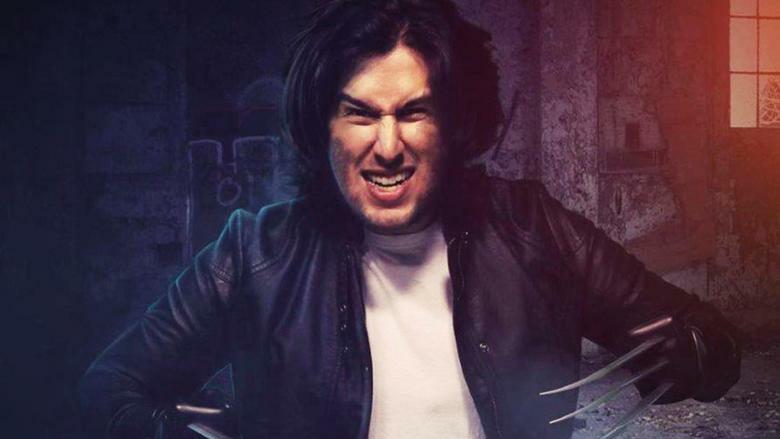 It resulted in a lot of awkward and worried looks from fellow passengers,’ recalls Saif Zulfiqar of his first swipe at Cosplay dressed as the sardonic mutant superhero from the X-Men series played by actor Hugh Jackman. 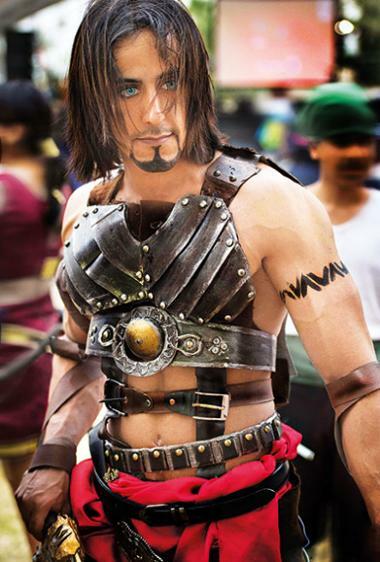 Cosplaying is the hobby that allows Saif to explore different aspects of his career. ‘While making a costume, props or armour, I get to take something that exist in 2D and make a 3D object of it. This helps tremendously with understanding functionality in character design and gives me a whole new perspective as an artist,’ he says of the two-week-long costume building sprees he enters into with his best friend, once winning third prize at MEFCC cosplay competition dressed as the Nightwing (complete with a motorcycle prop) and Penguin from Batman comics. Sometimes he purchases costumes. 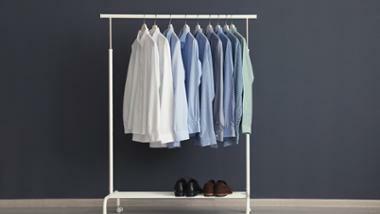 Sounds like a long stretch unless you realise that it draws parallels with American social psychologist Amy Cuddy’s Harvard study on ‘power-posing’ that says your body language governs how you feel. Saif’s superpower is his art and in line with the motto of his childhood idol Spiderman, he’s using his great power extremely responsibly by creating his very own comic book, which is why instead of participating at the MEFCC cosplay competition he’ll be manning his own stall at the artists alley dressed as Boba Fett from Star Wars. His dad sure must be proud. The course of true love never did run smooth. 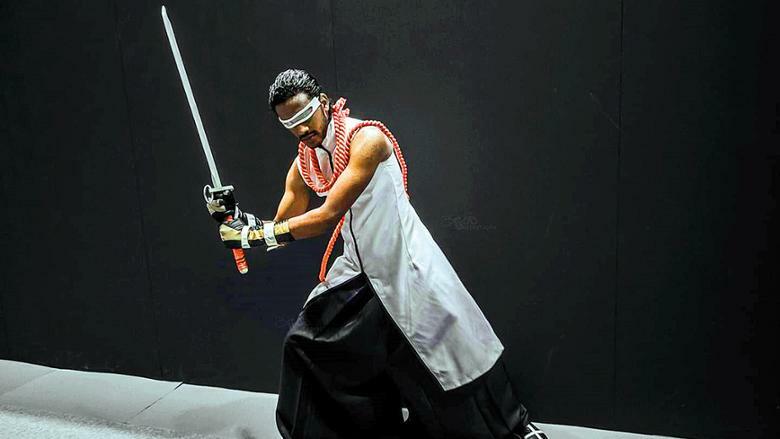 It took Saud Al Hazzani, six years of stumbling through different professions, including a stint at a big IT company before throwing caution to the winds and moving from Saudi Arabia to Dubai in 2017 to pursue one of his greatest passion — cosplaying. 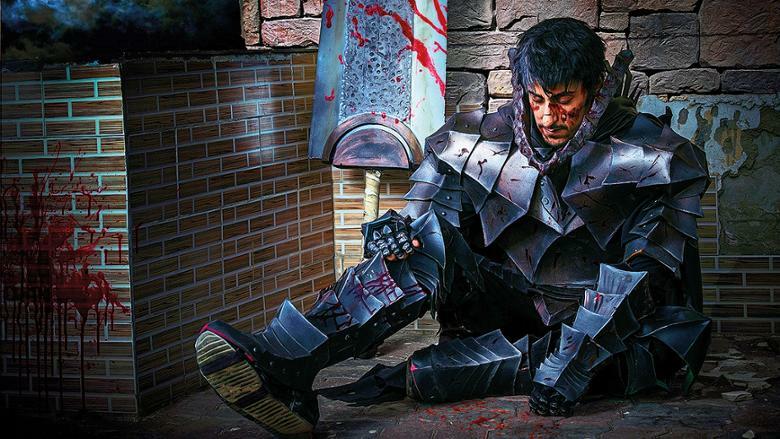 ‘I’ve always wanted to make a living doing something I’ve loved,’ says the full-time cosplayer. 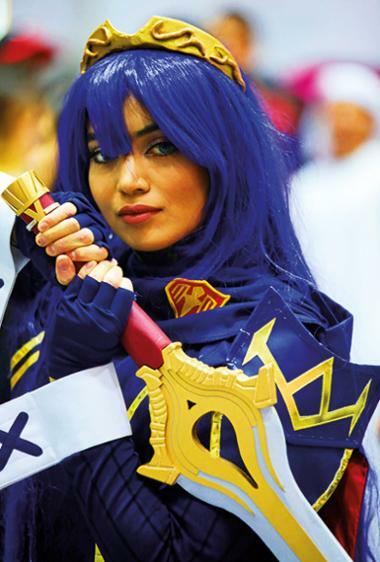 The path to his true love and fiancée, fellow cosplayer Sumi — also the reason for moving to the UAE — was fraught with fewer obstacles but came with enough costume changes to put a musical to shame. Saud has upped the ante with every costume he’s premiered at a convention since — complex electrical moving props and armour with intricate attention to detail have replaced the simple costume he cobbled up from ‘spray painted pants, fake chains, make-up tattoos and wings’. Going by the stage name of VegaCosplay, Saud is a celebrity in the regional cosplay scene and was nominated to participate at the 2017 World Cosplay Summit in Nagoya, Japan — the birthplace of anime. ‘It felt like a dream, it was magic and I’m really excited to share my knowledge with the winners of the UAE preliminaries this year,’ he says of judging the event today. Saud’s dedication to hand making each of his 40-plus costumes has seen him spend nights on the rooftop of friend’s flat sticking feathers to his Devil Jin costume’s wings while he was in-between jobs. ‘My costumes are usually 80 per cent handmade (I take help with sewing and make-up) and take two weeks on an average — that’s considered rushed but it’s directed by how soon an event is closing in.’ The longest he’s taken to create a costume — Guyver: Dark Hero — is four months. 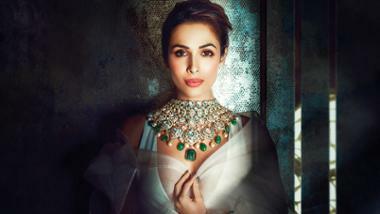 Sumi is living most little girls’ dreams: a grown-up playing dress up and pretend for a living — and having a blast. Disney princesses are the professional cosplayer’s speciality but mind you, she’s no damsel in distress having taught herself special effects make-up, mould casting and sculpturing, painting, stitching, styling and all of the other technicalities that go into handcrafting an accurate facsimile of the character she’s mimicking. It’s this attention to detail and perfection that make her a regular fixture at cosplay events around the GCC both as a participant and a judge. The only identity crises Sumi faces in life are what characters she should cosplay from the panoply of options on offer, effortlessly switching from sweet-faced Snow White to the sorceress Yennefer from the Witcher games, inhabiting the persona, quirks and mannerisms of the character, becoming their doppleganger. 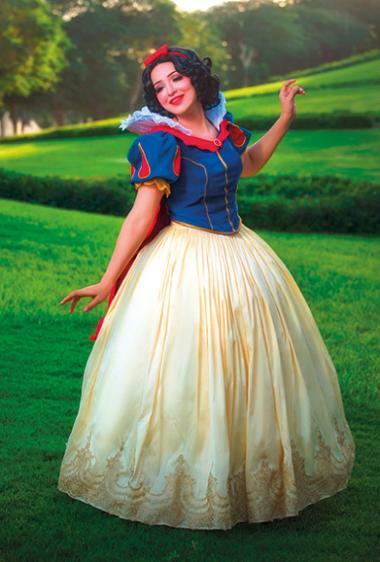 Trained in acting and filmmaking from NYU Abu Dhabi, performance is an innate skill and cosplaying offers up the world as a stage to the former actress (she’s acted in short films, Middle Eastern TV series) and triple-threat: ‘I like Disney characters because they offer me the chance to sing songs from the films, dance, act and there’s no better feeling than when little kids come and hug me believing I’m the real deal and go crazy! ‘I couldn’t even sit down for a few seconds when I went to Comic Con dressed as Elsa!’ Sumi puts the ‘role-play’ in Cosplay. Sumi finds picking a favourite difficult considering each csotume is a labour of love. 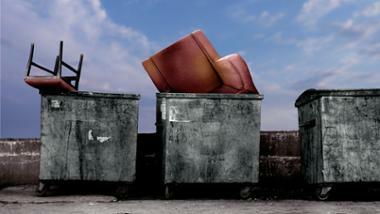 ‘Every character has a different memory attached to it and evokes a different mood and theme. But if I had to pick it’d be Elsa and Maleficent — I play characters because I know and love them and want to be them.’ Her quest for accuracy and authenticity ensures that she shares physical similarities such as body type, gender and occasionally facial features with characters to a certain extent. The rest is camouflaged by exceptional make-up and costume.